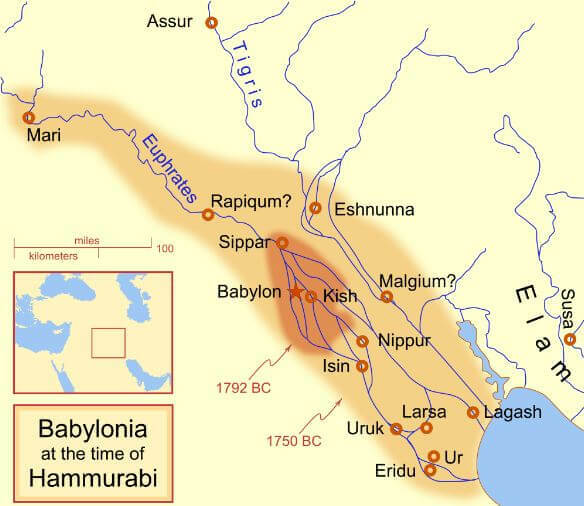 Babylon was located in what is currently the region of Iraq. To this land under Sumerian control, Semitic groups like the Akkadians and the Amorites arrived, coming from a country called Martu. This event indicates the decline and fall of the Third Dynasty of the Empire of Ur and the birth of the Babylonian Empire, which would develop intermittently between the years 2003 B.C. 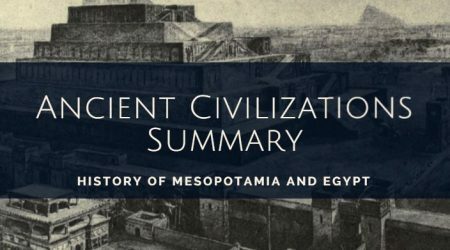 and 539 B.C and was one of the great empires which dominated the region of Mesopotamia. The Amorites achieved the imposition of their dynasties in the principal Mesopotamian cities, and Babylon eventually became the most important (Bávilou, meaning “gate of God”). The city, occupied by the Amorite king Sumuabum (1894-1881 B.C), founder of the new dynasty, became a major political, religious, economic and cultural center. His four following successors created the most important Amorite kingdom of the whole region which would reach its greatest splendor with the figure of Hammurabi, the most important king of the first dynasty of Babylonia, who reigned between the years 1792 and 1750 B.C. He cemented and provided the basis to the Babylonian Empire. During his reign, he established as the official language the Akkadian tongue, and as the religion worship of the god Marduk. 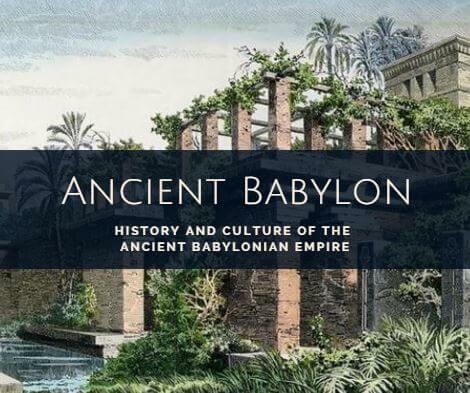 Under his mandate, the city of “Babirum,” Babylon (the Babel mentioned in the Bible), acquired great power, becoming the capital of a new empire whose dominion and influence would extend over the entire region of Mesopotamia. The Ancient Babylonian Empire was governed by a King, who was the absolute authority in the territory. In the history of Babylon, the most distinguished leader was Hammurabi who reigned between the years 1790 B.C and 1750 B.C, approximately. In addition to his importance as a conqueror, this king established the code of Hammurabi, which is the first code of written laws in history. It stands out that this code already granted to women the same rights as to men and in addition made provision for the possibility of divorce. This king was an absolute monarch. By this, it is meant that he was in charge of exercising legislative, judicial and executive power. He himself was in charge of dictating the rules to his liking and enforcing them. Under his position, there was another core which was formed by governors and some administrators. Not everyone could be one of these. It was a very select group and they were chosen by the king himself. Below them, were found the mayors and the councils of elders, who due to their experience, were charged with the administration of the town. These were the only figures who actually carried out the “political” labors. The rest of the population was divided between free men and slaves. Slaves were able to go as far as buying their own property. For their part, among free men, there were those of low class (peasants, small tradesmen), and those of high class (usually priests or merchants who reached great wealth). Hammurabi was a most illustrious sovereign, because apart from managing the administration of the nation in an efficient manner, he maintained the respect of the civilization, by the rights which he granted them. He fortified his capital, walling it in and extended his empire from Elam, which was in the east, to Syria, which was in the west. But his conquests and constructions, even though they were good, always stood out for how he achieved that his subjects should live in peace and justice. In this code was reflected the protective character which Hammurabi had towards his people and he was always the first to enforce the law, according to the established rules. Here is an example of how he enacted in his regulations. If someone steals something from the temple or the palace, he will die. If a man makes a hole in a house to enter and steal, he will be killed and he will be buried in front of the hole. If a man accuses another of a capital crime and cannot prove it, he will be punished with death. Yes, a lot of death here, but the regulations worked and a civilization could be seen, with a plausible and bearable political organization which bore fruit to a community which was just and which lived in peace. The great territorial expansion of the First Babylonian Empire was carried forward by Hammurabi. This king advanced on the Sumerian cities of Lower Mesopotamia and later came to dominate Upper Mesopotamia, as far as the Assyrian city of Mari. Thanks to these conquests, the empire of Hammurabi reached beyond Mesopotamia, covering from the Mediterranean Sea to Susa (in the region of Elam) and from Kurdistan to the Persian Gulf, in the south. 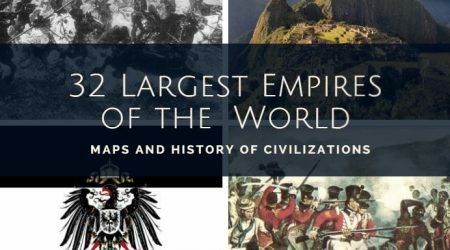 As we have said, it became one of the most flourishing empires of the time. The economic activities which developed during the First Babylonian Empire are well-known thanks to the laws of the Code of Hammurabi, which is a very important historical source and which helps historians to know what the economy was like during the Babylonian Empire. Thanks to it, we know that the base of the economy was agriculture, which just like the other nations (see Sumerians) depended on the construction of canals for irrigation. It was also an important development in livestock farming. The taxes or tributes to the Empire were paid in kind, that is to say, they consisted of the different products in which each region worked. Commerce and the development of the technology and infrastructures were also affected very positively by the cultural development and, in particular, the development of mathematics and engineering. On the one hand, advanced knowledge of engineering was needed to be able to accomplish the plans for all the dikes, dams and other works of great size which were brought to completion during this time, gathered more than anything from the previous knowledge of the Sumerians. In the same way, the sexagesimal metric system was used in Babylonia, which is a system very similar to our decimal system, but instead of being based on the number 10, it is based on 60. Thanks to the early development of this metric system in Babylonia the development of arithmetic or algebra was able to advance a great deal. They constructed great monuments as is the case of the temples whose buildings in form of terraced towers reached a total height exceeding 100 meters (328 feet). The temples also possessed decorations in relief narrating important aspects relating to worship and the deity to which homage was made on the walls of the main rooms. Anu: was the principal god during the most ancient era. He was the god of the sky. Enlil: he is the son of Anu. He carried the “tablet of destinies” with which he controlled the future of all beings. He ended up replacing his father as king of the gods. Ea (o Enki): is the god of magical knowledge, who controlled fresh water, so important for agriculture in Mesopotamia. He was also charged with teaching the different trades to humanity. Marduk: son of Ea. He was the principal god of Babylonia. He became king of the gods, beginning with the Babylonian Empire and also to other regions and cultures in Mesopotamia. Ishtar: she is the goddess of love. With various names, she was known in all of western Asia, becoming the most popular goddess of the Mesopotamian pantheon. Nabu: master of scribes and god of wisdom. 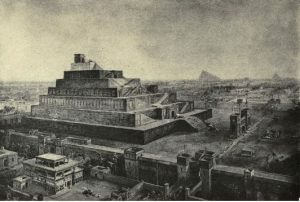 Unfortunately, due to the conquests and destruction of cities, to which was added the deterioration of time and erosion by environmental conditions, many of the works of art of the Babylonian culture were destroyed, but those which have been saved outline an important image for us of the general characteristics of the culture in these ancient cities. This ancient civilization possessed important knowledge related to astrology thanks to which they created a fairly accurate calendar, of which many aspects are still used. They possessed knowledge about medicine, the prevention of sicknesses and the containment or spread of the same, which is surprising today if one takes into account the antiquity of this nation. The knowledge they possessed regarding mathematics is astounding. Fundamental contributions of the Babylonians regarding technology, science, medicine, astronomy, and laws. The Babylonians achieved important results in the treatment of sicknesses beginning with organic natural compositions like honey and medicinal plants. They carried out surgical operations, diagnosis, and prognosis of recognized sicknesses in a written compendium. The prevention of sicknesses with the application of measures of personal hygiene which included frequent ablutions, washing of hands, boiling water and production with this of medicinal drinks as well as those for regular use. Also the use of symbols and described signs in their tablets which correspond to distinct sicknesses known to them and how to treat them effectively. Creation of religious services which spread, with modified versions, to other ancient cultures. They achieved the attainment of metal alloys with which they produced tools, weapons, and elements of decorative and utilitarian character like metal sculptures, jewelry, metal vessels, shields, bangles etc. Advanced knowledge regarding the use of irrigation for agriculture, rotation of fields and crops. 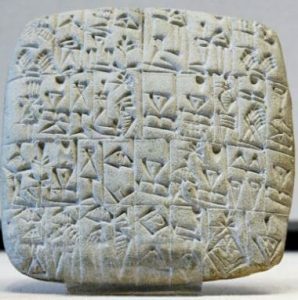 Utilization of cuneiform writing on baked clay cylinders and tablets, a technique inherited from the Sumerians, has contributed valuable information with which aspects of history, traditions, and culture could be documented. Surprising technology for the production of vitrified bricks used for the decoration of palaces and temples. Advanced mathematical and astronomical knowledge about constellations, distance from the earth to the sun, the solstices and equinoxes, that the orbit of the earth was elliptical, the number of planets in our galaxy, among others. Also the velocity of heavenly bodies using geometric figures like the trapezoid. The creation of the wheel in Sumeria and widespread use of the same in all of Mesopotamia. Babylonian doctors were capable of operating on their patients quite effectively and were punished if the patients died according to what was stipulated in the code of laws. In all of Mesopotamia as in Babylonia, the concepts of diagnosis of sicknesses, prognosis of the state of health of patients and the study of possible complications were introduced with time; based on the experiences previously recorded on their ceramic tablets in cuneiform writing. These tablets, which came to form a sort of compilation or book regarding the theme, reflected with detail descriptions containing symbols and signs which correspond to the distinct sicknesses know to them and how to treat them effectively. The cleanness of a city was seen by Mesopotamian cultures as an important element in the prevention of sicknesses. 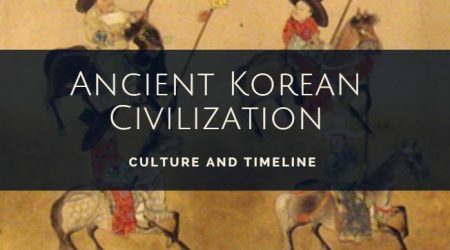 Where they obtained this knowledge still remains a mystery, above all if it is taken into account that we are talking about conglomerations of humans who formed civilizations in which the theories on the matter indicate civilizations like those of the Neolithic period. They were able to obtain metal alloys with which they produced tools, weapons, and elements of decorative and utilitarian character such as, for example, metal sculptures. Techniques like “granulation,” of fine appearance and great variety, as well as the system of embossing metal; with exquisite mastery in the results, were widely utilized in jewelry, decoration of weapons, shields of war, metal vessels, etc. They did not produce these objects only for their own personal consumption, but they were instead marketed, having a wide demand for their quality even in geographically remote areas. The technique of applying Chalcedony beads was very popular at this time, as well as their beautiful works in applications of Lapis lazuli. Advanced knowledge regarding the use of irrigation for agriculture, rotation of fields and crops permitted them not only to settle in those areas which presented limitations with conditions not suitable for agriculture, but also to prosper in such a way that population growth and sustenance was possible through the infrastructure they developed, managing to be one of the most important empires of the era whose technical and scientific advances were assimilated by other cultures as well. The city of Babylon reaches its greatest splendor with the figure of Hammurabi, most important king of the first dynasty of Babylon, who reigned between the years 1792 and 1750 B.B. He cemented and provided the basis to the Babylonian Empire. 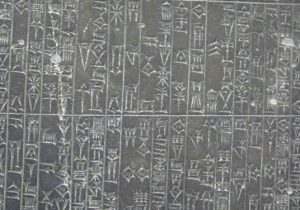 Hammurabi’s code of laws, the first legislation know to history, possesses a surprising property and it is its capacity to be understood, its wisdom and the understanding of human behavior which it demonstrates. It is significant that many of its precepts are in force because they foresee many of the possible situations which may be presented in the social or private lives of individuals. This code catches sight of aspects which today are contained in the modern legislations of many countries. This advanced thought which systematizes and governs according to a written code how justice and the behavior citizens will follow will be imposed reveals a high level in the development of this civilization. The utilization of cuneiform script inherited from the Sumerians, (the predecessor culture to them in that region of Mesopotamia), has contributed valuable information with which aspects of history, traditions and culture could be documented, starting with baked clay cylinders and tablets with cuneiform writing. By these tablets we have been able to know that the main product which they exported were woven products and that great quantities of gold and silver which came from the tributes of smaller cities under their dominion were at their disposal to be used as much in the maintenance of the cities as in the army and military campaigns. Only the scribes were versed in this technique and for this were widely appreciated. The Babylonian nation had the same needs for subsistence as the other nations had, they were also conquered in the same way they conquered other nations, their necessity for protection which reaches from defense from enemies, injustices against the weak, appropriate weather conditions to develop their crops and all the other reasons for which human beings venerate a deity or heroic figure; all were present in Babylon and contributed to creating and promoting the spread of religions through the world. These religions were based on stories which oddly enough have points of contact with the stories of religions of other cultures in the rest of the planet. Many of these stories even coincide with passages of the Bible, and stories in mythologies like the Greek and Roman mythologies. 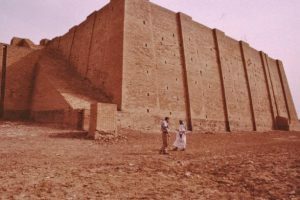 Among the techniques that the Babylonians developed, the production of vitrified brick used for decoration of palaces and temples stands out. The decoration of the entrance to the city known as “The Ishtar Gate” stands out, in which numerous vitrified bricks colored with intense shades of blue and other colors which show us representations of animals which it is supposed had the job of protecting the entrance to the city. This technique imitated by other cultures has unfortunately disappeared and in spite of having tried to reproduce it in the present, the attempts have been unfruitful. It is a mystery how they were able to produce in substantial quantities these vitrified bricks. The pigments utilized in addition to natural material themselves were diluted in exact, precise quantities and producing this on a grand scale would require such a knowledge of chemistry and the properties of natural compositions that it is truly a mystery how they were able to achieve it, or how they managed to obtain this knowledge which not even today has been able to be reproduced. One of the great mysteries which this culture presents us is how it was possible that they, like the Sumerians and Assyrians, knew such advanced elements of astronomy as if in fact they had been able to contemplate the cosmos from a perspective external to the earth and not a simple contemplation of the stars from the surface of the planet. But in addition, all this knowledge obtained only during the short time that this culture arose, developed and later was extinguished. They knew the number of planets in the solar system, in a relief is shown a representation of the solar system with the planets rotating around the sun. They possessed specific mathematical and astronomical knowledge about the constellations, distance from the earth to the sun, the solstices and equinoxes, that the orbit of the earth was elliptical, they knew how to calculate the movements of the sun, the moon, stars, and planets. They could calculate the occurrence of solar and lunar eclipses and in general knowledge which humanity only came to rediscover thousands of years after the flourishing of these Mesopotamian and Egyptian cultures. They situated the sun as the center of the galaxy around which the planets rotated. Their broad knowledge of Astronomy and mathematics permitted them to develop an effective system for recording time. They decided to register the passing of a year for which they included twelve months. For the course of a month, they selected 30 days, the day in twelve hours, an hour in sixty minutes and a minute in sixty seconds. 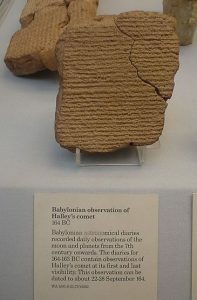 The recent translation of Babylonian ceramic tablets has brought to discovery that their astronomers could, utilizing the geometric figure of a trapezoid, establish the location, movement, and velocity of stars. They did it by calculating the area of a trapezoid they had traced using values obtained in their previous observations of sightings of the star in different points of observation, measuring later from one side to the other of this geometric shape and averaging out the results. In this way they obtained a number, corresponding in total to the velocity and the time passed from when it moved from one point to the other, therefore the velocity of its habitual passage in a determined period of time. On one of these tablets it is described in detail; how using these advanced geometric calculations, they could determine at what velocity Jupiter moved between different points of observation, by which they could measure its habitual velocity. The Babylonian priests developed the zodiacal system of signs corresponding to the planets, constellations etc. originally there were thirteen, later they were reduced to twelve. This knowledge later gave rise to the development of what is known as astrology. The discovery of the wheel in Sumeria around the year 3500 (B.B) in the Mesopotamian region, was one of the most important technological advances in the history of mankind. The Babylonians received this invention and developed it even more in the sense of the multiple applications for which they used the wheel. It is nearly impossible to create a mechanism of movement today which does not entail the use of the wheel. 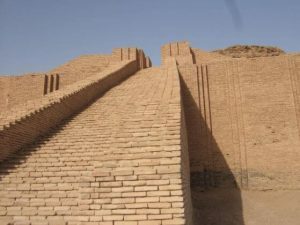 Their buildings and temples were constructed based on knowledge of mathematical measurements and physical principles which today appear to us normal to know, but the great question is how the Babylonians and Mesopotamian cultures knew them 5000 years before. With the translation of the tablets written in cuneiform, new elements progressively reach us which contribute a little more light as to who the Babylonians, and the cultures with which they had relationships, whether by invasions or simple commercial relationships, were. The problems in the Empire started shortly after the death of King Hammurabi (second half of the 18th Century B.C) when various peoples subdued by the Babylonians begin to rebel. The final fall of the Empire will come in the 16th Century when the Hittite people invade the city and destroy it. Later, a new period of splendor for the Babylonian Empire arrives, but this finally ends with the invasion by the Persian Empire in the year 539 B.B. More than 1200 years after the reign of Hammurabi, all that was created there, they began to change in a scandalous manner. The social structure, the architecture, art, science, and literature were retouched. The social organization appeared affected. Luckily, they were only small details, seeing as the essence was conserved.